Hi Yann Can you introduce you ? 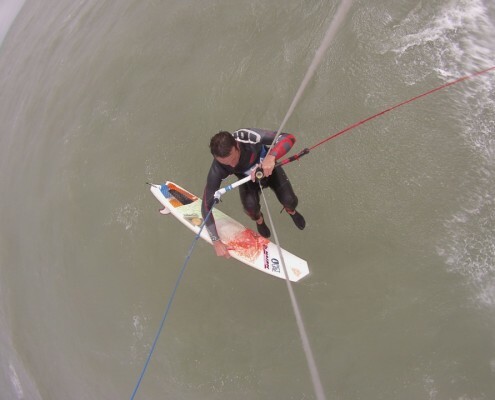 Yann Cudicini, I have been kitesurfing since 1998 on the local spots around Leucate, South of France. I started first on directional boards, twin tips, strapped boards. 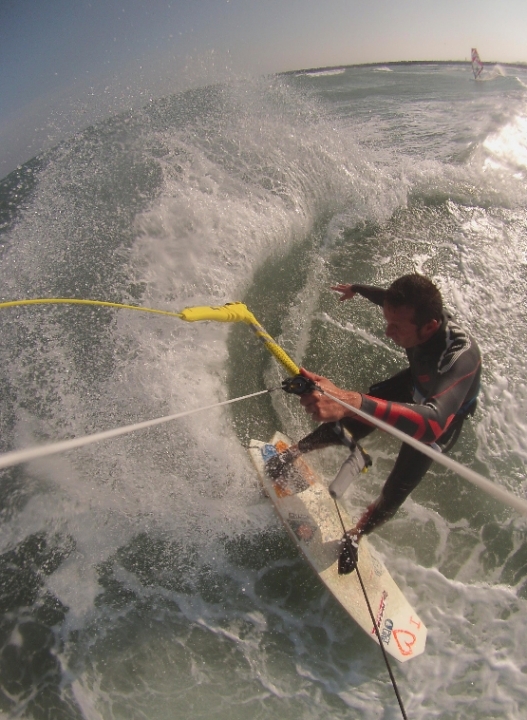 But for the last few years though, I have been riding strapless. 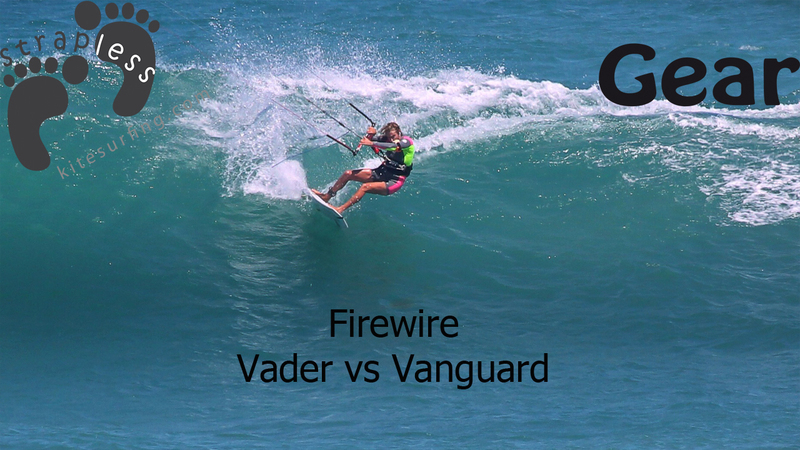 Tell us more about the FireWire Vanguard. 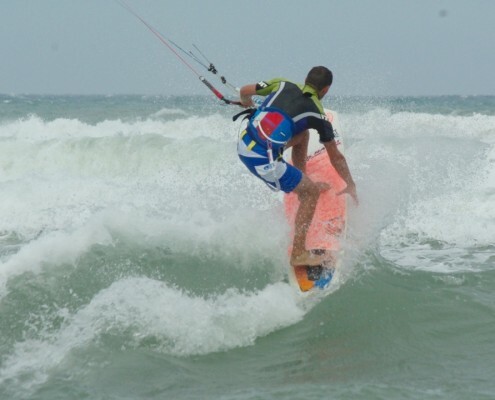 Lately, I have been riding a Naish Pivot and a Firewire Vanguard 5.2 (I am 5’9” for 145 lbs), thanks to my sponsor: NAISHPROCENTERLEUCATE (The local KiteShop), Ion France, and Organic clothing. 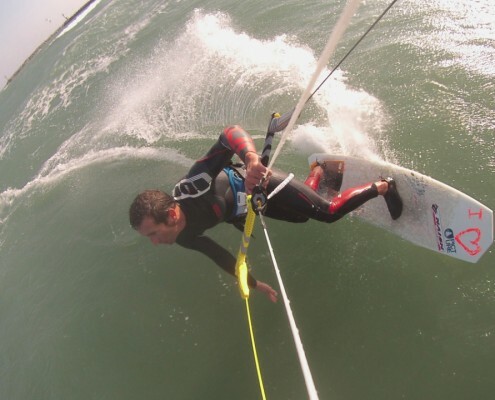 In 2013, I rode mostly a Naish, Custom LE 5.10. 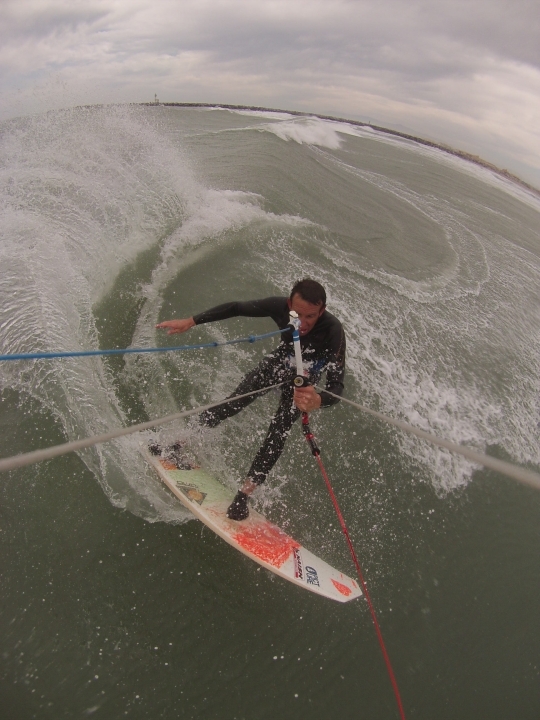 But starting in 2014, I have been going crazy over a totally different board, the “Firewire Vanguard 5.2 “. I mount it in a Truster settings, and I ride it waxed. What about your first contact? 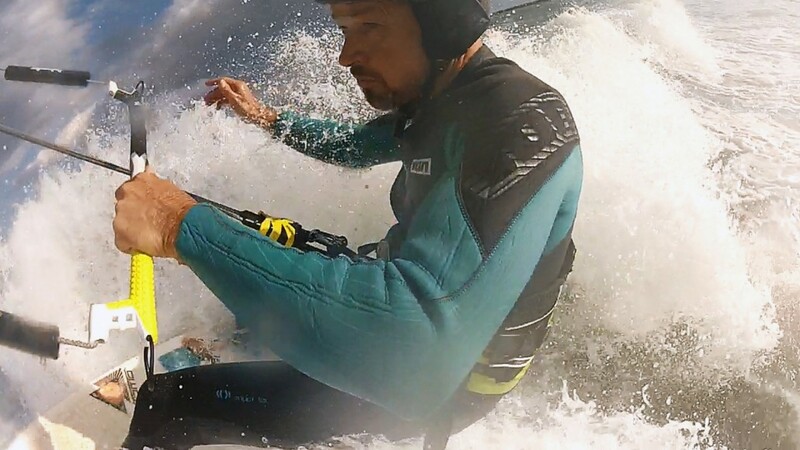 On my first try, with so-so conditions (onshore wind), 4 small waves were enough to know that I had made the right choice: this is a very accessible strapless board, very stable when passing waves, on every jibe, or when tacking: it provides a great gliding feeling, and it lands jumps very well. According to you, what are the best sailing conditions to use it ? 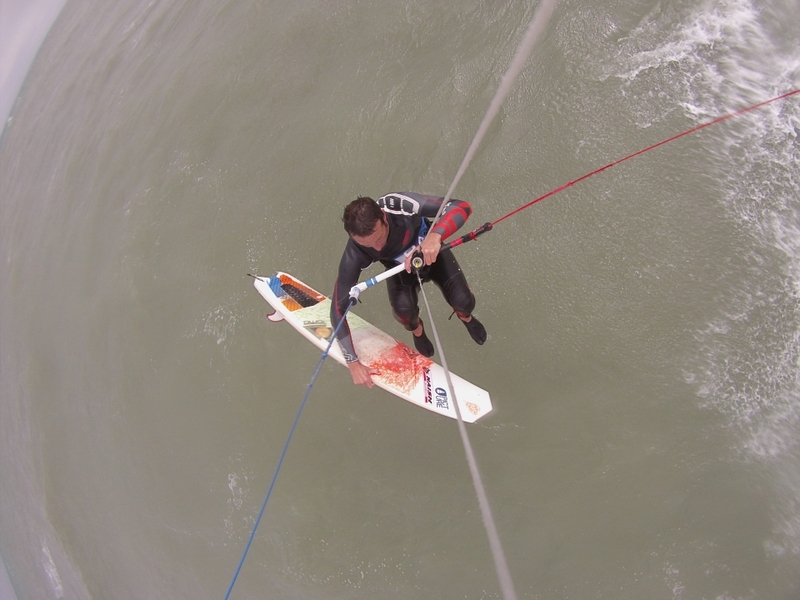 I have also ridden the Firewire Vanguard 5.2 many time with very windy and choppy mediterranean conditions in La Franqui when the Tramontane is blowing: the board is easy and soft with good feedback. 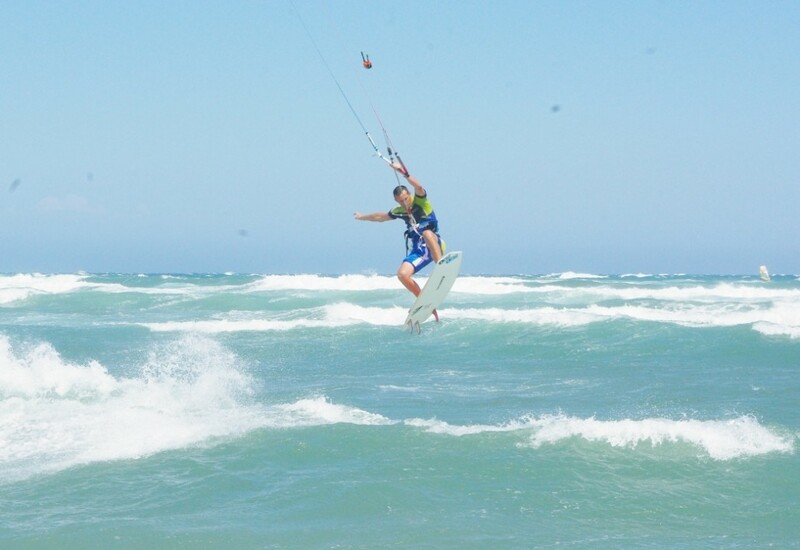 It is also an ideal board for light wind conditions. What are the limits of the Vanguard? 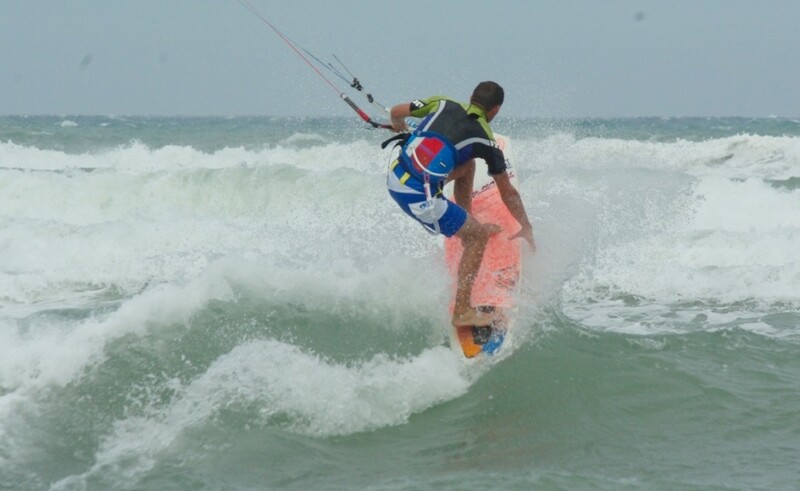 In very heavy surf though, the board reaches its limit. 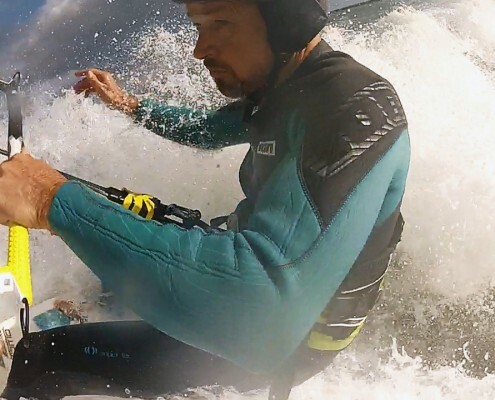 In these conditions, a more classic surf shape is more appropriate. I also don’t recommend it when the winds turn violent and too strong. 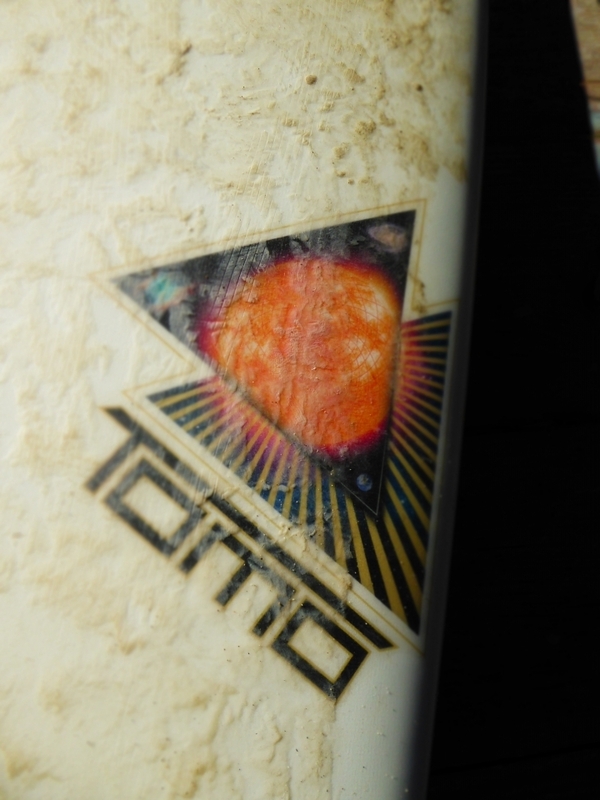 Now regarding aesthetic, I have heard a bit of everything on it: let’s say that in 2015, all brands follow the “TOMO board” shape, more or less. Hi Cynbad you are regular rider in the highlights of straplesskitesurfing.com, can you introduce you to the newcomers ? 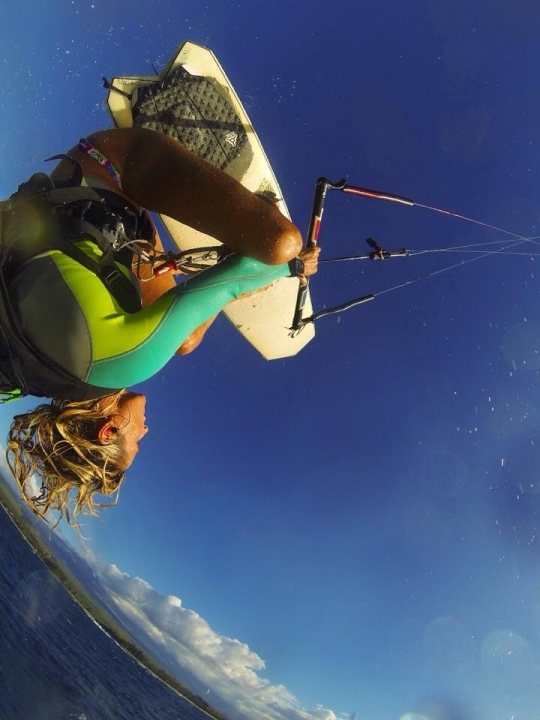 My name is Cynthia Brown and my nickname is ‘Cynbad’, which I acquired during my windsurf sailing days, 15 years ago. 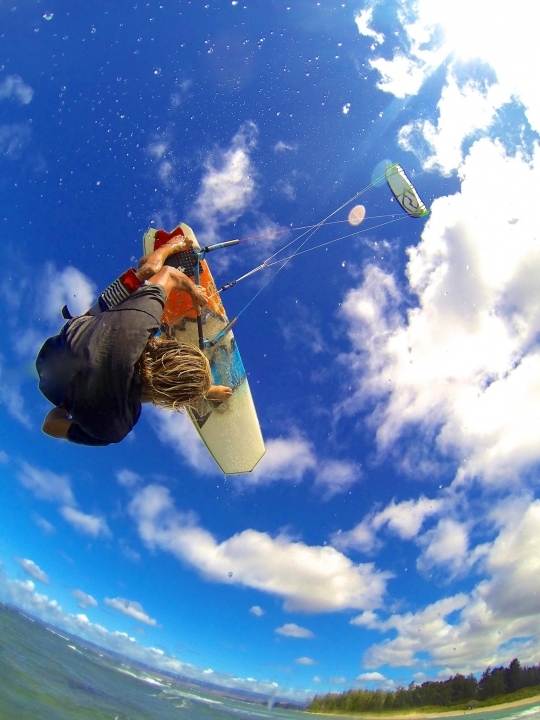 I am fortunate enough to be sponsored by Ozone kites, Firewire Surfboards, Ride Engine harness’, and Wizmount camera systems. What are your weight and size? I am 5’7″ and weigh a whopping 125lbs. What are the best sailing conditions to exploit the Vanguard ? Why? And its limits ? I have been riding the vanguard exclusively for over a year now, and have had it excel in every condition. 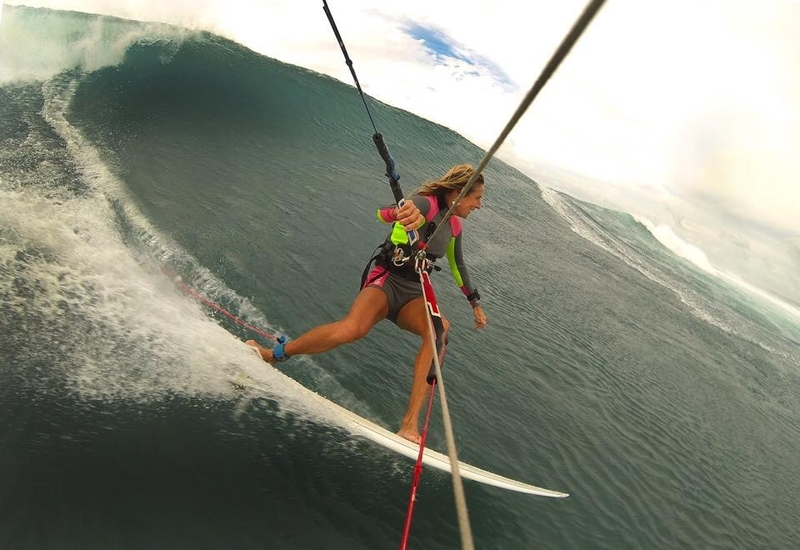 From light wind, butter glass; nasty wind chopped fresh water; to double overhead Hawaiian surf. 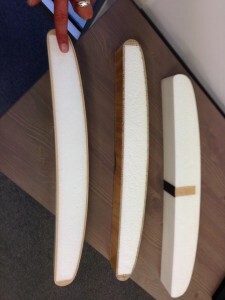 The most dramatic difference from a typical board would be the Modern Planing Hull (MPH) design, which allows the board to plane vs sink into the water. While riding you can actually feel the Vanguard ‘hydroplaning’, thus sucking up chop and reaching incredible controlled speeds. 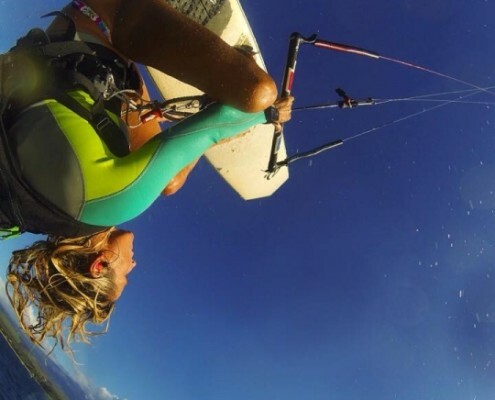 Additionally the parallel outline translates into unsurpassed upwind capability. 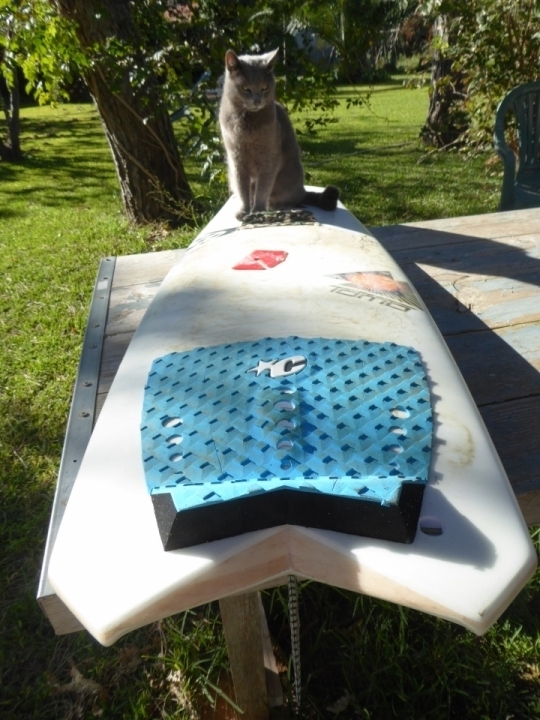 Because of these design features you should purchase a board shorter then what you would normally think. I ride a 5’6″ in a traditional shape, but a 5’0″ in the Vanguard. 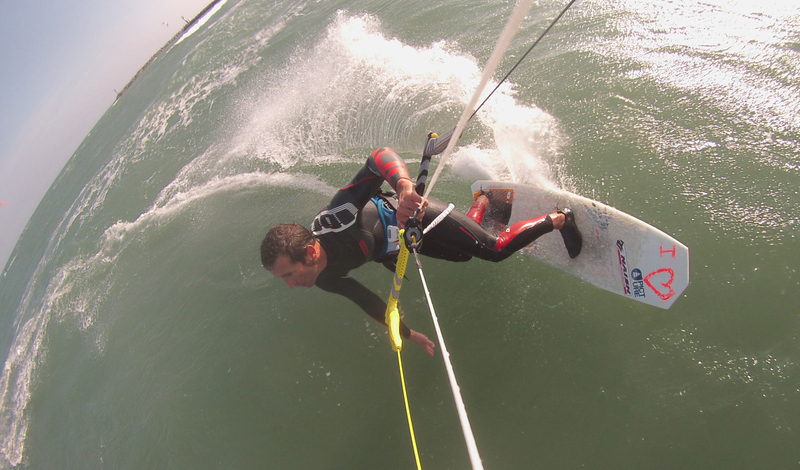 The only limit I have found is that the board likes to be ridden tail foot heavy rather then front foot heavy, in large surf. I recommend placing your tail kick pad as far back as possible for maximum pleasure. 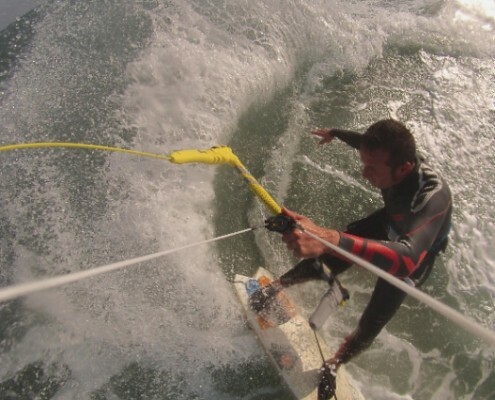 What kind of maneuvers can you do better than on a classical surf shape? Anything related to ariels. 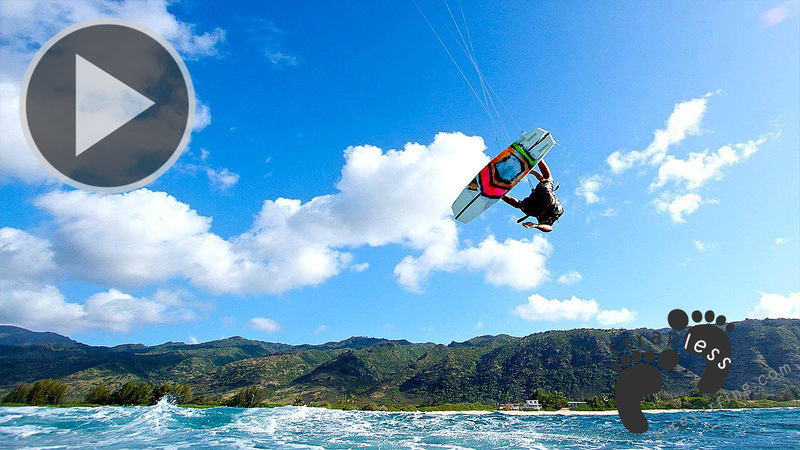 The speed the board generates equals maximum ‘pop’, and the compact, uniform shape allows for super uber control while airborne. It truly has aircraft capabilities. What about the durability of the construction ? 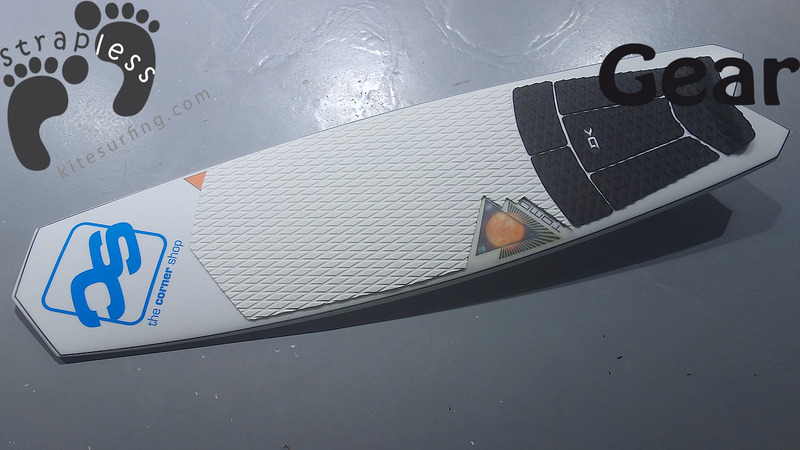 The board is made using the Future Shapes Technology (FST) construction. 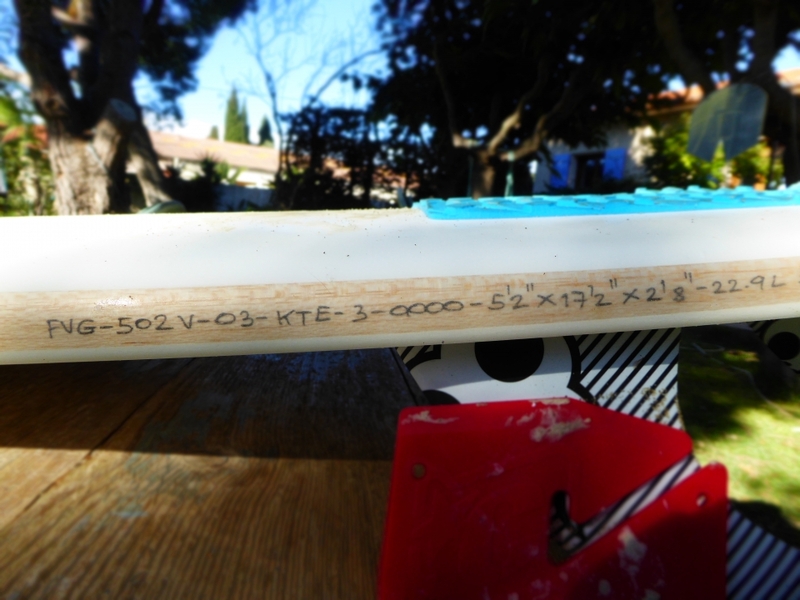 FireWire is regularly modifying the strength to weight ratio to ensure that the boards perform well and will last. 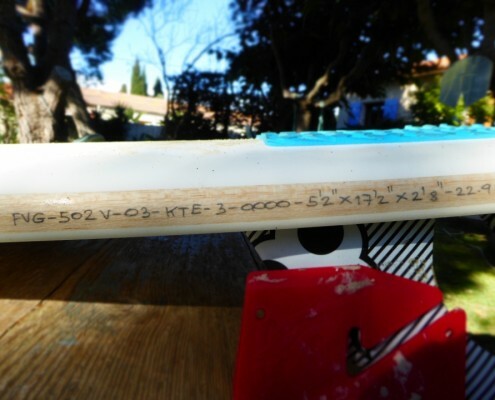 Slices of Firewire : FST, Timbertek and Surf constructions. Best session with the Vanguard? 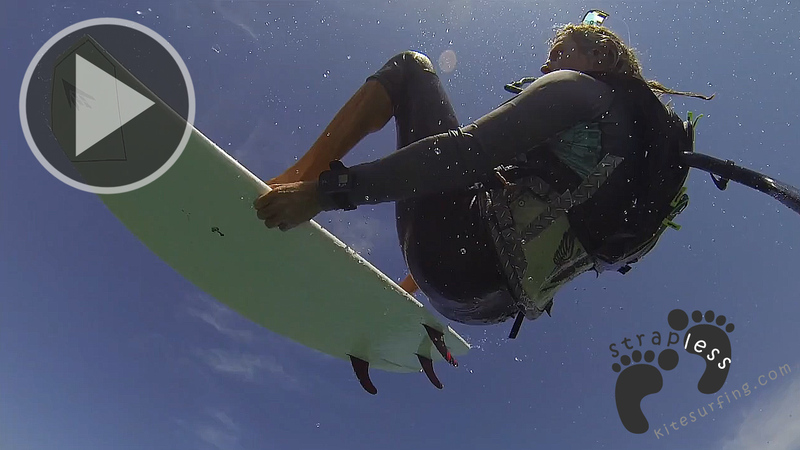 A couple of weeks ago at Spartan’s Reef on the North shore of Maui. 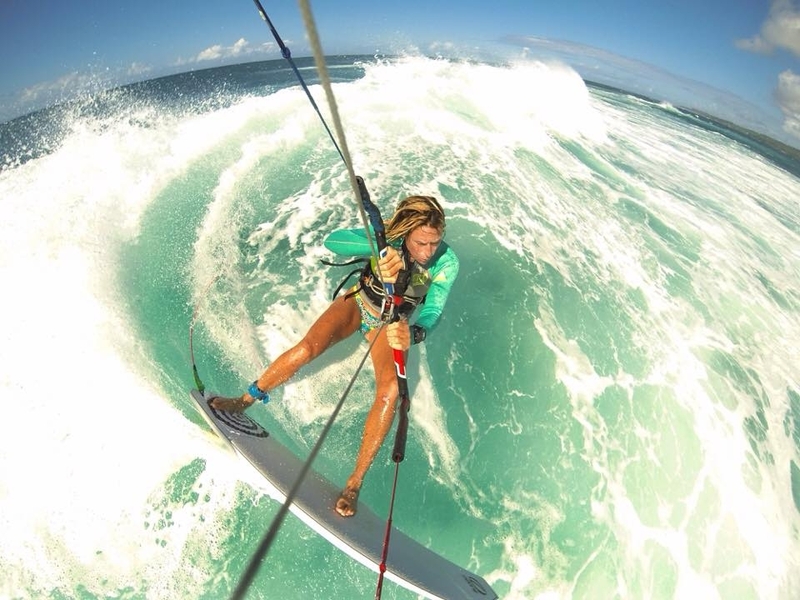 The swell was 8′ Hawaiian (which translates to 12′-15’faces), and I flying a 6m Ozone Reo kite. I felt like I was skateboarding monster, turquoise mountains, in complete control. As much as It was ‘love at first ride’, it did take a while for me to get used to the look of the Vanguard’s unconventional shape. Sort of like looking down at a set of contemporary powder skis when you’re used to your old 205s from the 1980s. We are so accustomed to seeing equipment look a certain way, that it’s initially hard to appreciate new high performance aesthetics. 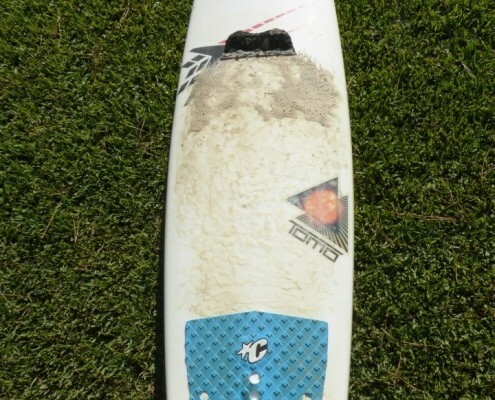 Now after a year of Vanguard bliss, traditional surf shapes seem odd to me. 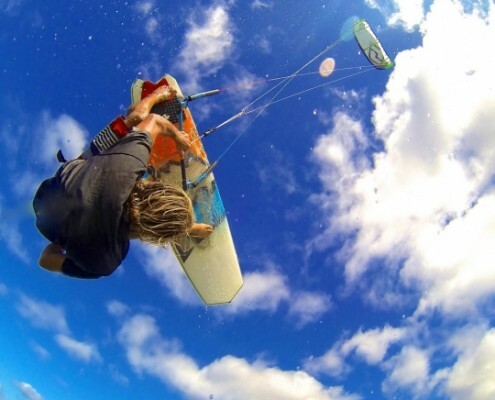 Without question, the Vanguard is hands down the most fun board that I have ever had under my feet while flying a kite, and I hope everyone gets a chance to experience it. What can we say after Cynbad’s write up ? 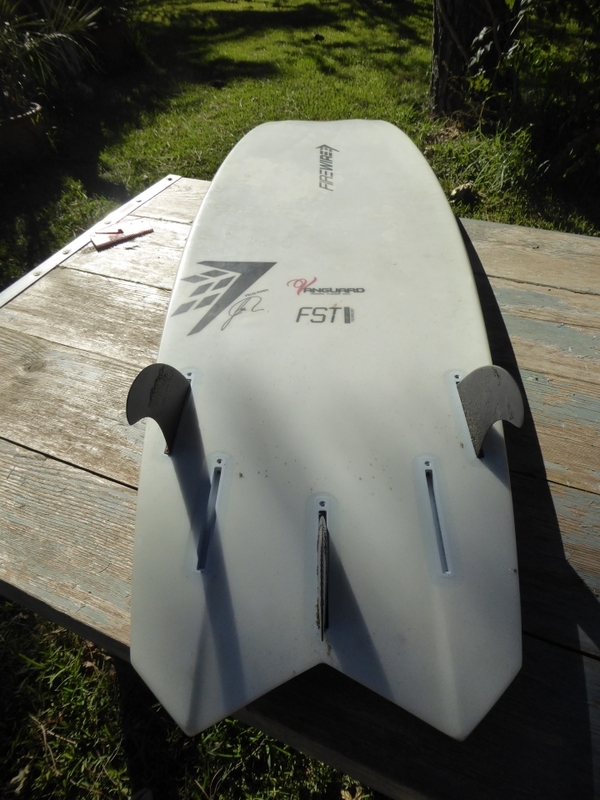 I would say that the Vanguard fits very well with my quiver composed of a 5’11 Firewire and a 5’10 HB surfkite. 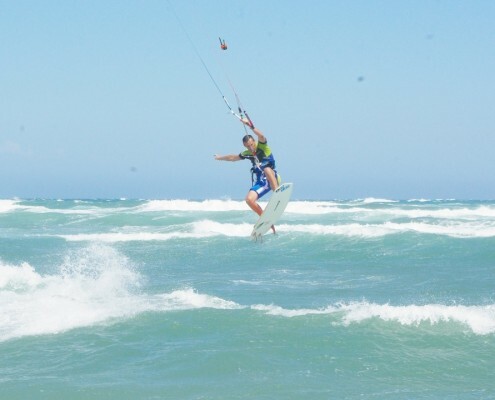 I’m 6’1” 5/8 (1,87m) and weigh 172Lbs (78kg), using Bladekites Skinnyboy 6m and 8m in all of kind of sailing conditions. 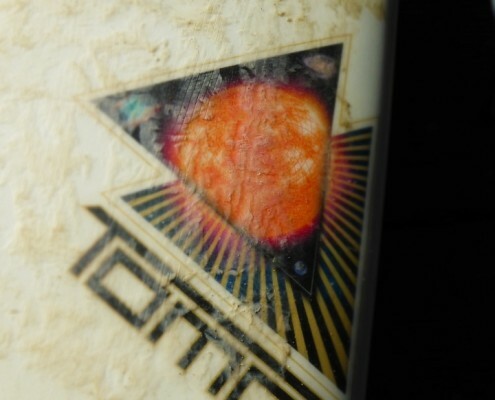 The 5’2 is a very playful board, surprising at first by ithe Tomo shape. 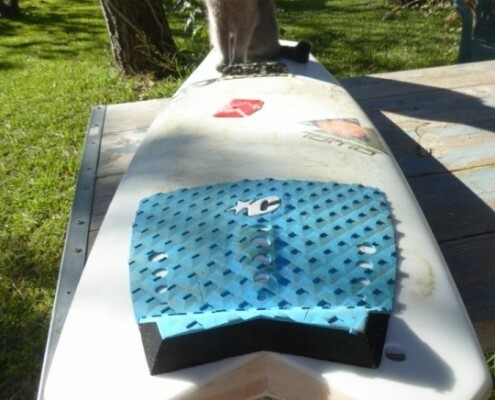 A noseless board can be destabilizing : I was looking for the nose in first surfs ! 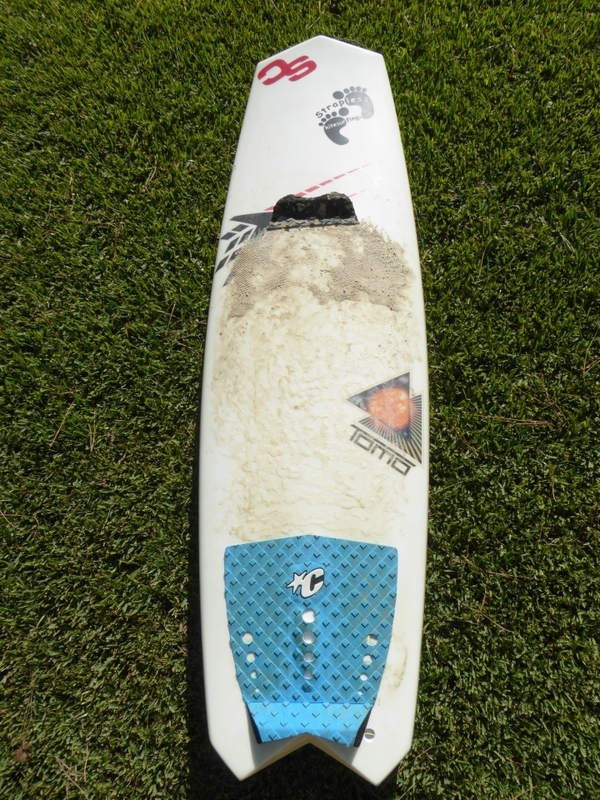 The board is soft in the surf, forgives a lot thank to the concave hull but allows radical slashes. 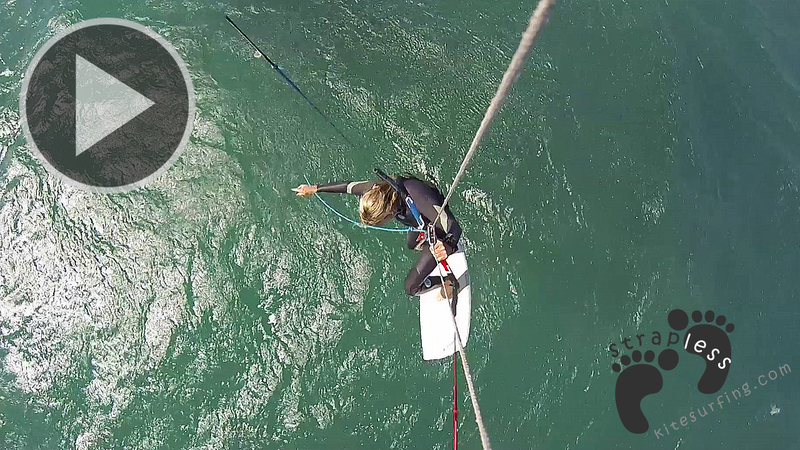 With its parallel rails the vanguard has got an incredible ability to go upwind, and added to a wide swallow tail, that gives a huge potential for jumping and flying in onshore winds with a full control. 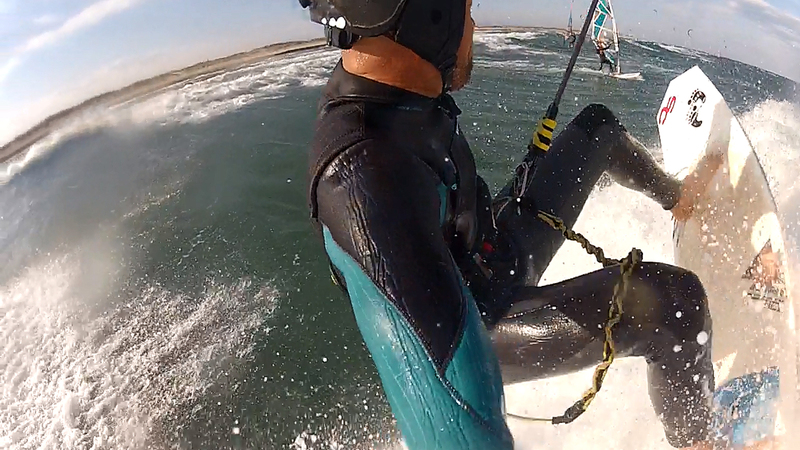 These specs do not affect the ability in front side surfs ! Very good ! 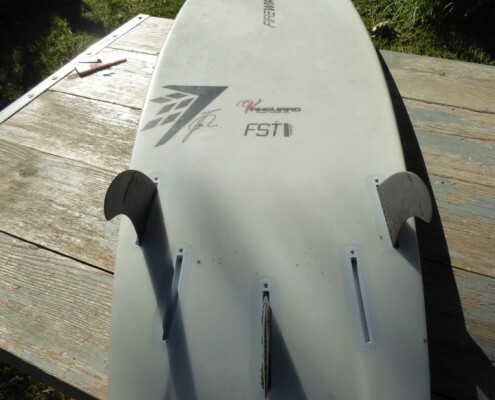 About durability, I own 2 other Firewire boards, Fst construction for 3 years…nothing to say except they are nicely finished and bulletproof! 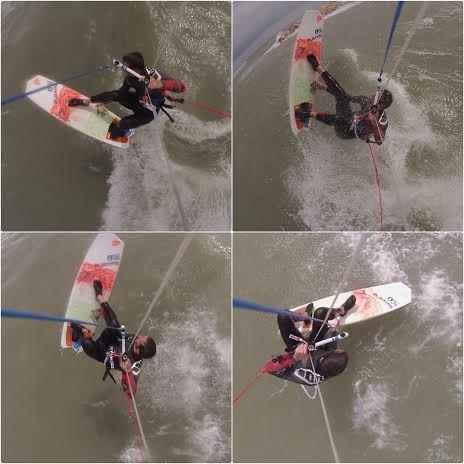 Felix Pivec, Ryan Oates and Cynbad in the Vanguard Action video and Tomo interviewed by Brian Friedmann.